There are several distinct patches of them, all the same species as far as I can tell… it’s the common snowdrop Galanthus nivalis. It’s always the snowdrops in full sun that flower first and those in shady places flower later. The common snowdrop is widely grown throughout gardens and parks in the UK. 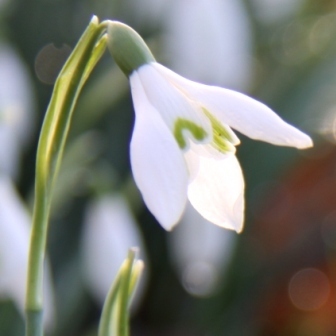 It’s a hardy plant producing tiny nodding white flowers in early January and February. 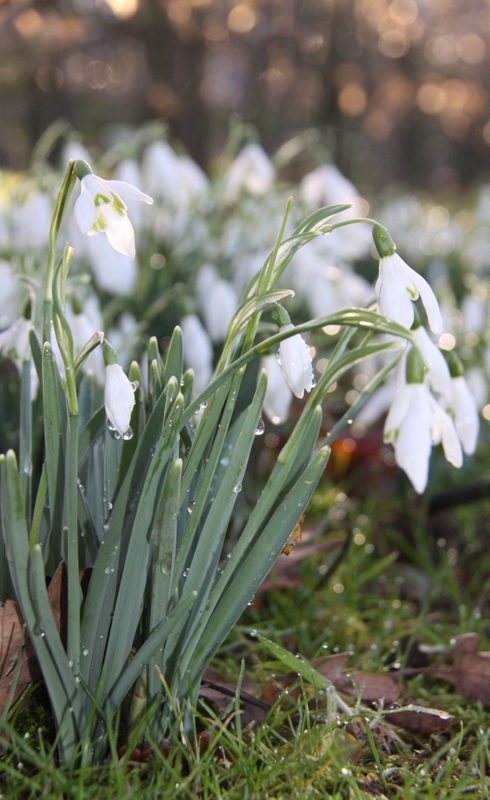 Snowdrops are easy and quick to establish – especially if you plant them whilst they have visible foliage. That’s known as “in the green” when good results are most likely. Dry bulbs are more difficult to get going… but not impossible. 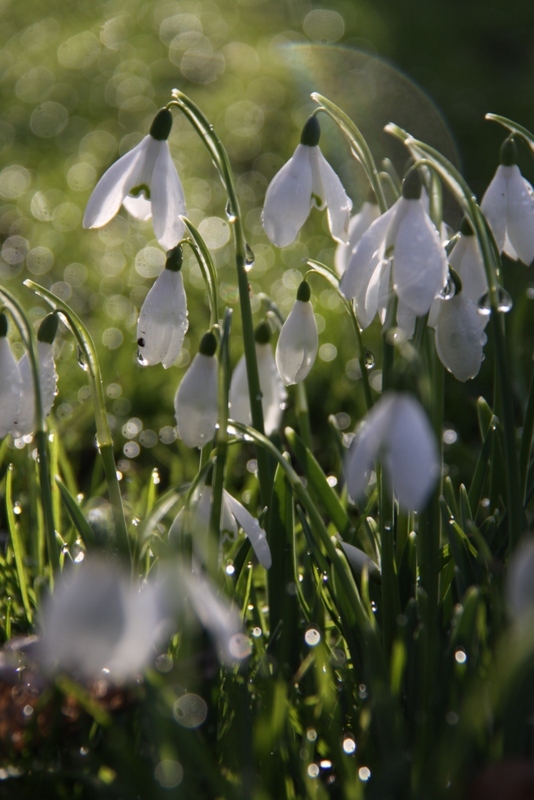 Snowdrops grow best in moist soil with some shade. They need plenty of sunshine for a couple of months after flowering so that the leaves can return nutrients to the bulbs for flowering next year. Each bulb produces a single white flower. Look closely and you’ll see pale green markings and narrow grey-green leaves. Grow them with hostas and ferns in a woodland garden. Plant a row under a deciduous hedge. Naturalise in grass under fruit trees with daffodils. Plant them with primroses around tall deciduous shrubs in a mixed border. We had just a few snowdrops when we moved here 10 years ago. Since then they have multiplied and I’ve helped them on their way. Each year after flowering I dig up congested clumps and gently break them apart. Most books tell you to replant the bulbs individually but I prefer to plant a group of five or six together. It’s much quicker and they establish good clumps quickly too.